Paym.es - Receive payments via Instagram, Facebook Messenger, Twitter, LetGo, Etsy, WhatsApp, and Telegram. No need to establish a company. No need to register. Get paid just like chatting on Facebook, Instagram, and Etsy. All done in 20 seconds! E-commerce with Paymes is as easy as texting a friend. You can safely receive your payment from all around the world with Paymes. Personal or corporate, you can split all your sales into 12 installments. Make sales without a website or a company. There are no endless forms to fill or boring approval processes. You can start using it right away. Save both your time and your money with low commission rates of Paymes. *Paymes offers the best prices for face to face sales! *The commission rate for face to face sales is 2.99% for individuals and 2.50% for institutions. Your payments are sent to your account every Thursday via Paymes. Paym.es, özellikle kredi kartı kullanmak isteyen danışanlarım için çok büyük kolaylık ve konfor sunuyor. Ek aplikasyon, onay süresi olmadan ödeme alabiliyorum. Receive payments via Instagram, Facebook Messenger, Twitter, LetGo, Etsy, WhatsApp, and Telegram. By registering to our platform, users agree that they have read and agreed the User Agreement and Prohibited goods/services agreement. 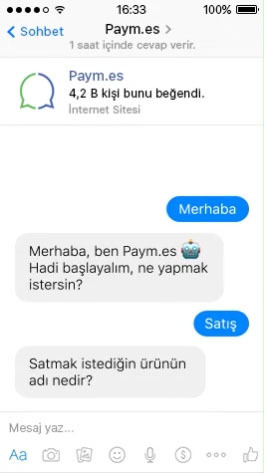 Paymes Elektronik Ticaret ve Bilişim Teknolojileri Anonim Şirketi is in partnership with Payu Ödeme Sistemleri Anonim Şirketi, a company certified by Banking Regulation and Supervision Agency.